Free Download Cucusoft iPhone Video Converter 8.08 - Convert your favorite movie to iPhone Movie. Cucusoft iPhone Video Converter is a simple but capable utility to convert video to iPhone (MP4) fast and with top quality. It supports all popular input video formats, including MPEG, DivX, XviD, MOV, RM, RMVB, WMV, AVI, etc. You can watch your favorite movies everywhere now using your iPhone as portable player. Cucusoft iPhone Video Converter provides outstanding performance due to conversion speed being faster than real-time. The user interface of the iPhone converter is divided into three zones. In the left zone, you can open video you want to convert and preview it in the built-in player designed as iPhone. The player window is attached at the bottom. Another zone allows you to choose output profile and destination for your iPhone video. The iPhone Video Converter provides predefined profiles grouped into 3 categories: iPhone, iPod, and Common Audio. Eight different iPhone video specifications are ready to be used. The last zone of the program window, called 'Conversion status', allows to supervise conversion of the input file to iPhone Movie. After conversion is done you are offered to launch iTunes to upload the converted video to your iPhone. The converter offers predefined output profiles for iPod and default MP3 file format as well. More advanced users may adjust output settings to better suit their needs and save the settings for future reference. The iPhone converter allows customization for video options (video bitrate, frame rate and video size) and audio options (audio bitrate, sample rate and channel) to set quality and size of the output video. iPhone Movie Converter records directly to the desired output format without any temporary AVI file to ensure fast conversion speed. Download this easy-to-use but capable iPhone Video Converter and test it for free now! Review Cucusoft iPhone Video Converter! 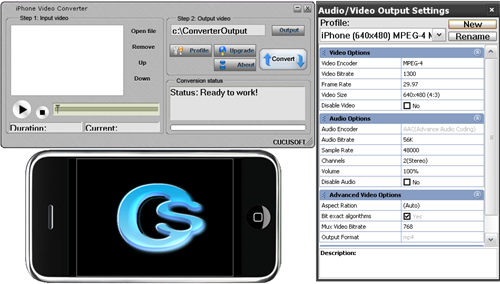 Cucusoft iPhone Video Converter 8.08 - Simple and capable iPhone video converter, supports DivX, MOV, MPEG, WMV, AVI.